At a castle somewhere remote, a billionaire nuclear physicist paid for by the government laments the environmental consequences of his inventions. Going mad, he constructs a giant shrink wrapping machine, the Wrap Walker, which will cover the globe in plastic. Then, once the plastic coating finally biodegrades after a few thousand years, the ozone layer will have been restored (though all living things on Earth will have suffocated). Splinter, having complete knowledge of this scheme without explanation, dispatches the Turtles to the castle to stop the Wrap Walker. Alerted to their approach, the mad physicist traps the Turtles in a net and has a flying robot drop them off on a desert island. While moping around the island, Raph finds a positively ancient box of emergency rations and downs a meatloaf sandwich. Unfortunately, the rations were tainted with radiation and Raph begins to expand and inflate because I don’t know. Leo then has a brilliant idea to use Raph as a life raft and the Turtles set sail. After two days at sea, they return to New York, where a vendor is conveniently on the beach selling various medical supplies. 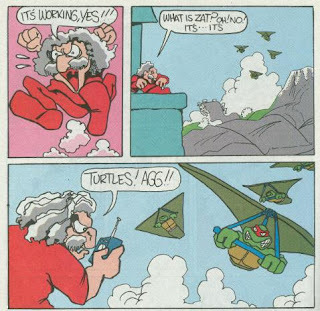 Mike buys Raph some iodine tablets to counter the radiation (causing Raph to cartoonishly deflate like a balloon) and the Turtles head back to the castle. Arriving via hang-glider, they destroy the controls to the Wrap Walker just as it takes its first leap. The Wrap Walker crashes and destroys itself. Don then uses some of the shrink wrap to truss up the mad physicist, commenting that he’s about to be “zip locked” behind bars. *While I’m not normally inclined to call “non-canon” status on a TMNT Adventures story due to silliness, I’m afraid that’s the direction I’m gonna have to go in on this one. Considering Mark Bode’s last story, “Ninjara vs. Mondo Dog Catcher” was also a non-canon story, I feel a little better about it. Mark Bode’ is back with another crazy weird short. I love Bode’s visual style, but his storytelling relies too much on random zaniness for my taste. 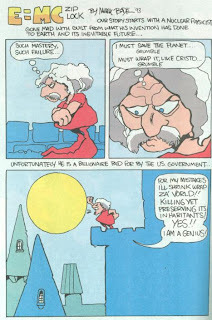 The difference between cartoonists like him and Milton Knight, who both have bizarre artstyles, is that Knight follows an internal consistency in his comics. The plots may by nuts, but they follow their own logic and there’s a reason for everything that goes on. So even though those stories look as bizarre as all Hell, they make just enough sense from beginning to end to really be no wackier than the other stuff going on in TMNT Adventures. 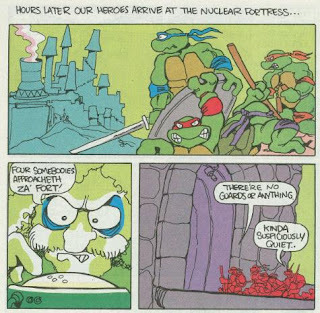 Bode’, on the other hand, employs too much unexplained nonsense for his stories to really work inside the canon of TMNT Adventures. That doesn’t make them bad stories by any means, just that they should be taken at face value as the goofy, silly comedy pieces they are and not something with any relevance to the ongoing narrative of the title. “E = MC Zip Lock” is a fun little romp for what it is. In a way, it feels like the Turtles have been dropped inside a Mega Man game. There’s an evil German-accented scientist that looks like Albert Einstein building robots inside his castle/fortress with designs on taking over and/or destroying the world. 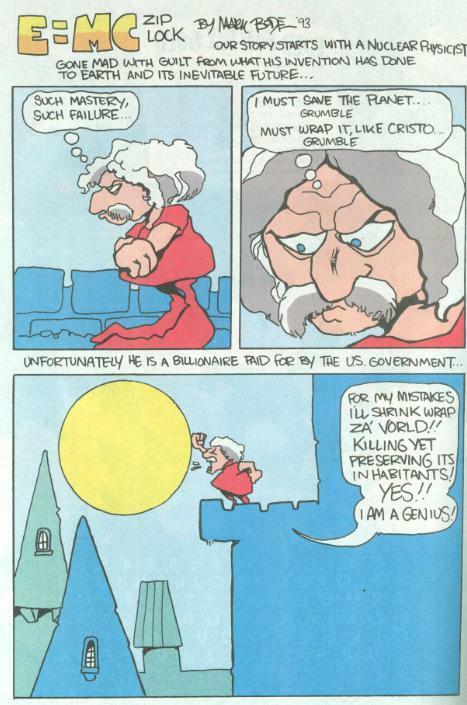 The mad physicist never got a name in this story, but in my head he might as well be Dr. Wily. So from that perspective, the story is awesome. I didn't even know this story existed, as Mirage's TMNT site didn't even mention it in their summary of TMNTA Special #11.